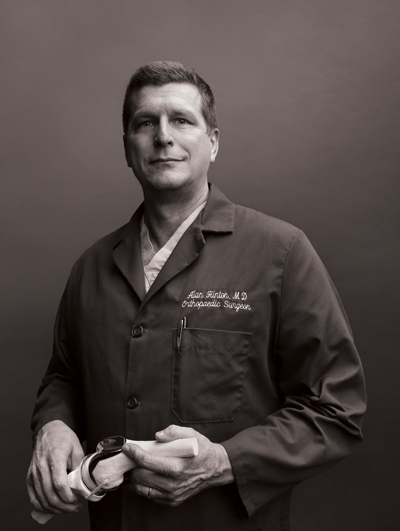 Alan Hinton, MD treats his patients like family and literally helps them get back on their feet again. Mobility is something most people take for granted. When one joint starts to fail, whether it be a knee, a hip or a shoulder, it can affect the entire body. It can make a person’s life miserable and render simple, ordinary tasks either impossible or painfully frustrating. Alan Hinton, MD, of Hinton Orthopedics in Lake Charles, takes pride in being able to get his patients back to their lives. The 54-year-old Dr. Hinton recalled a case from three years ago where he helped a patient regain his mobility and independence. A man in his early 40s had struggled with morbid obesity. He was bedridden. Successful weight loss surgery reduced his weight from over 400 pounds to 250. Still, he couldn’t resume a normal life because of crippling arthritis in his knees. Many patients with arthritis have knees that look fairly normal, but this man’s knees were bent and crooked. Walking and driving were impossible. Dr. Hinton helped by replacing both of the man’s knees. The patient stayed in the hospital for a couple of nights, then went to in-patient physical therapy for two weeks, followed by home-care physical therapy for a month and then out-patient therapy. The hard work paid off. He now leads a relatively normal, active life and holds a job. About six months ago, Dr. Hinton ran into his former patient at the grocery store and was happy to see him getting around easily. “It (the surgery) was really a life changing event for the guy,” said Dr. Hinton. Hinton Orthopedics is a family-run practice. Dr. Hinton’s wife, Bridget, who has a degree in mechanical engineering, works as the office manager. Dr. Hinton said he doesn’t advertise and relies on word-of-mouth to attract new patients. To achieve positive word-of-mouth requires both strong medical treatment and a caring personal touch. When he is not practicing medicine, Dr. Hinton is a passionate beekeeper who owns 17 hives. Last summer, he harvested 28 gallons of honey. It’s a hobby Dr. Hinton laughingly attributed to his fondness for baklava and other sweet desserts. The hives require maintenance, but he doesn’t find the work intimidating or scary. Dr. Hinton was born in Lake Charles. He stayed in Lake Charles through college, graduating from McNeese State with a BS in chemical engineering in 1985. He attended medical school at LSU Medical Center in New Orleans, graduating in 1989. Outside of his work with his patients, he is also currently working on a grassroots research project with McNeese State and the New Orleans BioInnovation Center using stem cells for meniscus regeneration in pigs. He and his wife (and office manager) Bridget have three children: Lauren (age 26), Kristen (age 25), and John (age 20).